The video contains shocking footages of the current garbage crisis that Lebanon is facing. According to reports, what looked like a river that snaked through the streets of Lebanon was actually piles and piles of plastic which contains household wastes. This crisis began when the landfill south of Beirut was closed with no plan in place for an alternative. The river of garbage in the Lebanese capital. The Lebanese government stated that they have approved of a plan to solve this crisis which has been ongoing for seven months now. It has since then fuelled numerous protests against the dysfunctional state and raised concerns for public health. 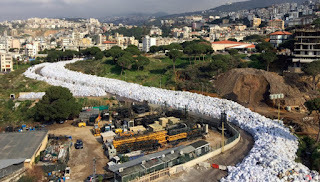 Two landfills will be established near Beirut, and a third one south of the city will be reopened for two months to receive rubbish that has piled up since July, Information Minister Ramzi Jreij said after a cabinet meeting. The government had been working on a plan to export the waste. But this was scrapped last month because the firm chosen failed to obtain documents showing that Russia, the intended destination, had agreed to accept it. However, protesters cry for the government to find a sustainable, real, hygienic solution.